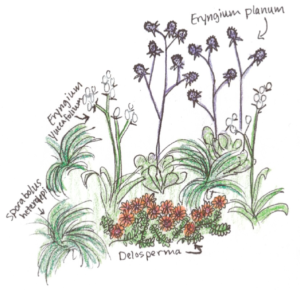 With growing season and FloraKansas on the horizon, we have been asking a few questions of ourselves over the past few months about native plants. Certainly, we have seen the benefits of using native plants in the Arboretum and at our homes, but what would it take to convince someone to install them in their yard who has never tried them or is unfamiliar with them? What would it take to begin to change their minds? We keep coming back to this idea of beautiful AND good. Aesthetics are important and we all want attractive landscapes, but so is this feeling that what we are doing is good for everyone and everything. It can be intimidating to change the way you garden or landscape. Choosing plants just because they are visually appealing simply isn’t a good enough reason anymore. Creating a habitat using plants that are adapted to your site is a far better approach to landscaping. Designs that have attractive combinations of wildflowers, grasses, shrubs and trees may initially capture our imaginations, but more and more people are wanting these plants and their landscapes as a whole to provide additional benefits. Our gardens must now not just look good, but also do double duty to provide for pollinators, attracts birds and other wildlife, develop habitat and positively impact the environment. The evidence that making such a change will really make a difference in our lives and in our gardens begins with the first native plant. I have seen it time and again – if you plant them, they will come to your garden. If you plant milkweeds, the monarchs will find them; if you plant penstemons, the bumble bees will find them; and if you plant asters, a flock of pollinators will cover them in the fall. It sounds so simple, but it is indeed true. These plants need the pollinators and the pollinators need these plants. The significance of planting your first wildflower can be both beautiful and good. 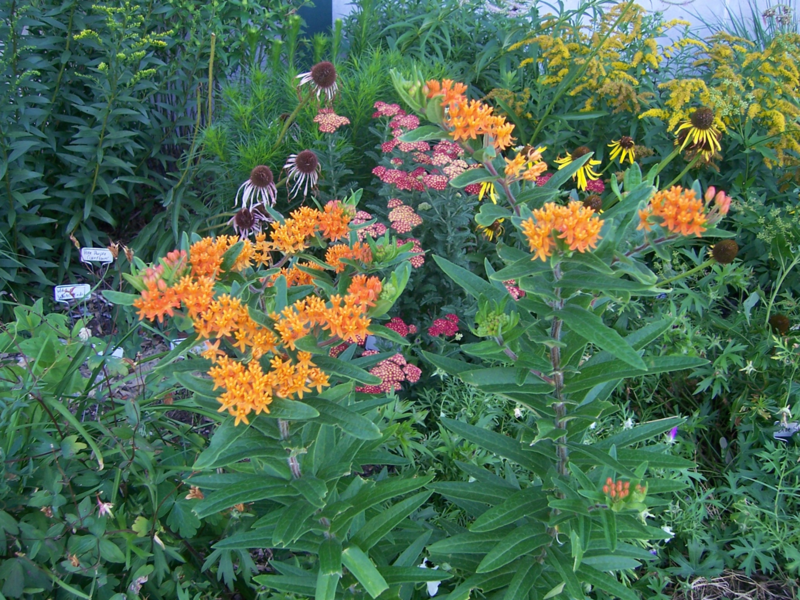 If you want to be part of the solution and do your part for nature by reducing water usage and eliminating chemicals, attracting countless forms of beneficial wildlife including butterflies, hummingbirds, and pollinators, cleaning storm water runoff, and having a beautiful landscape, start with a few native plants. Each of us CAN have a positive impact. We are stewards of these ecological, environmental, and sustainable gardens. An aesthetically pleasing landscape can also be functional and serve a variety of purposes. Home landscapes can be transformed using native plants so that they are sustainable, easy to maintain, and beautiful. To start planning your native plant garden, be sure to attend our FloraKansas Spring Plant Sale and look over our 2017 plant list. Monarch ovipositing on common milkweed (April 9, 2017). There are many positive things that can be said about insects. They are important to healthy ecosystems. If you have any appreciation for wildlife of any kind in Kansas, you have insects to thank. Aside from a handful of pests they are beneficial to humans as well. Click HERE to see an earlier blog post on why I am in awe of insects. Many insect species require a specific host plant or group of plants to feed their young. Therefore, it should be no surprise that greater plant diversity leads to greater insect diversity and ultimately a greater abundance of wildlife. I like to see more biological diversity in urban landscapes and this is why my landscaping tendencies trend towards more plant diversity rather than less. Butterfly enthusiast and master gardener Lenora Larson gave us this similar message last month at our March winter lecture. 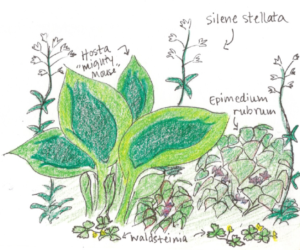 She highlighted more than two dozen species of butterflies and moths that folks can easily attract to their landscape with specific host plants. A summary of her presentation, host plant and butterfly species lists, and helpful references can be found HERE. Monarch egg on common milkweed (April 10, 2017). A little over a week ago on April 9, I saw my first couple of northerly migrating monarchs of the season. There were many other reports of first of season monarchs reported that weekend as well. 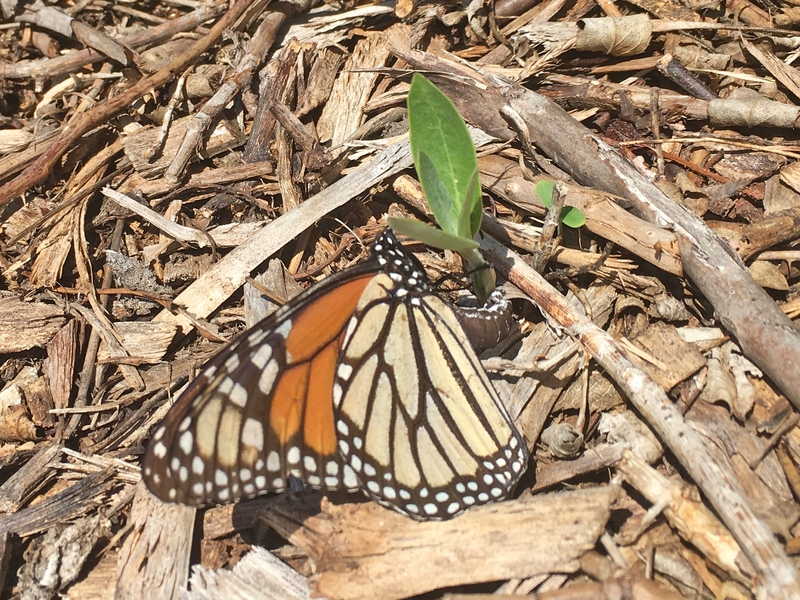 In the week since, newly emerged milkweed shoots more often than not are found hosting one to six monarch eggs each. 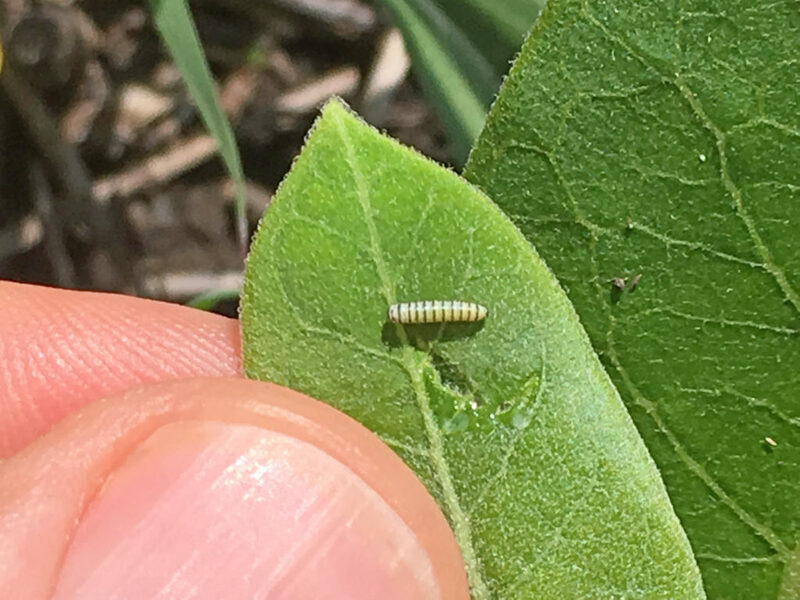 Yesterday on April 18, nine days after the first monarch siting, I observed the first two hatched caterpillars. More on the plight of the monarch and why we are so carefully observing this progress can be found HERE in an earlier blog post. 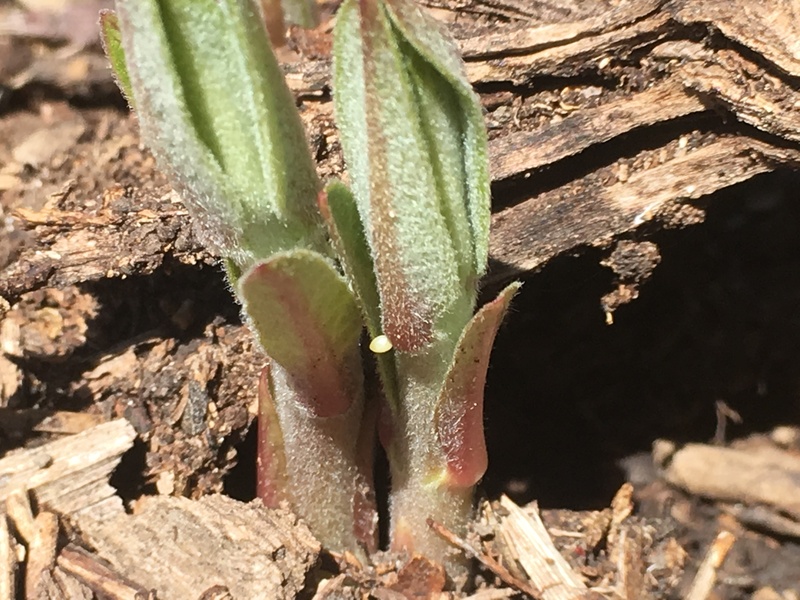 Newly hatched monarch caterpillar on common milkweed (April 18). 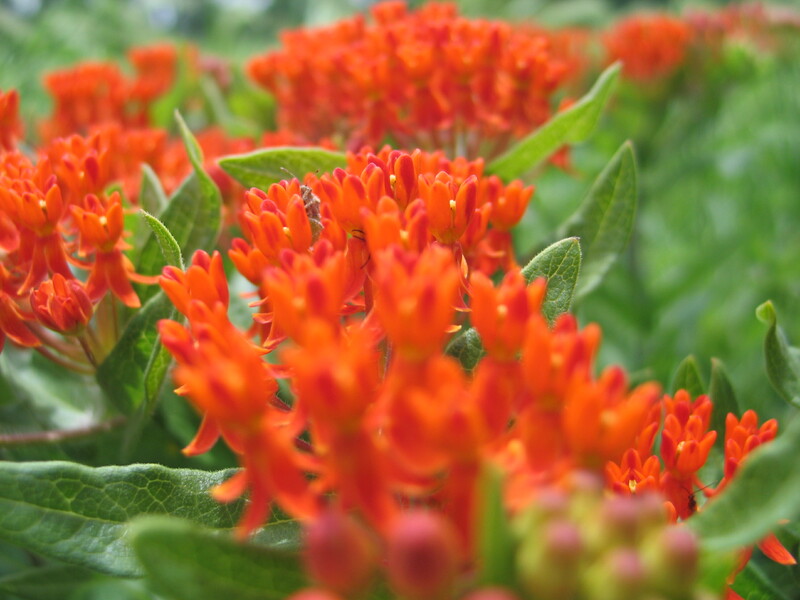 We’ll be touting at our spring plant sale the many benefits of gardening with Kansas native plants. Attracting insects and biological diversity to your landscape is one of those many benefits. We are experiencing a paradigm shift that is sweeping across the country. People are becoming increasingly aware of the natural world and their ability to impact it. If we begin establishing landscapes that appeal to us aesthetically, but benefit wildlife ecologically, we can have the best of both worlds. 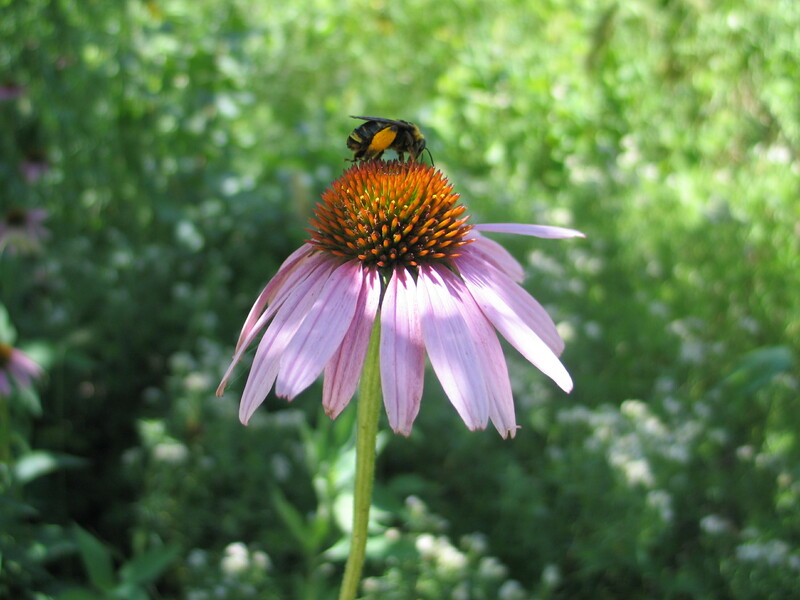 Each of us has the opportunity to develop a native wildlife habitat, to design your garden in such a way that attracts pollinators and wildlife, and to create a safe space for depleted and endangered native bees and Monarchs to find the food they need to survive. This is a small way you can show you care. It is one way you, along with others in your neighborhood, can develop prairie gardens that are refuges for these beneficial insects. Even a small garden can have an impact. Statistics show that the monarch butterfly population in North America has declined by over 90% in just the last 20 years. This is disheartening. One of the biggest factors in monarch decline is the increasing scarcity of its only caterpillar host plant: milkweeds. Monarchs can’t successfully reproduce, or migrate without milkweeds, resulting in the species decline. If you plant even a few milkweeds in your own garden, you can help reverse the fortune of these beautiful insects. 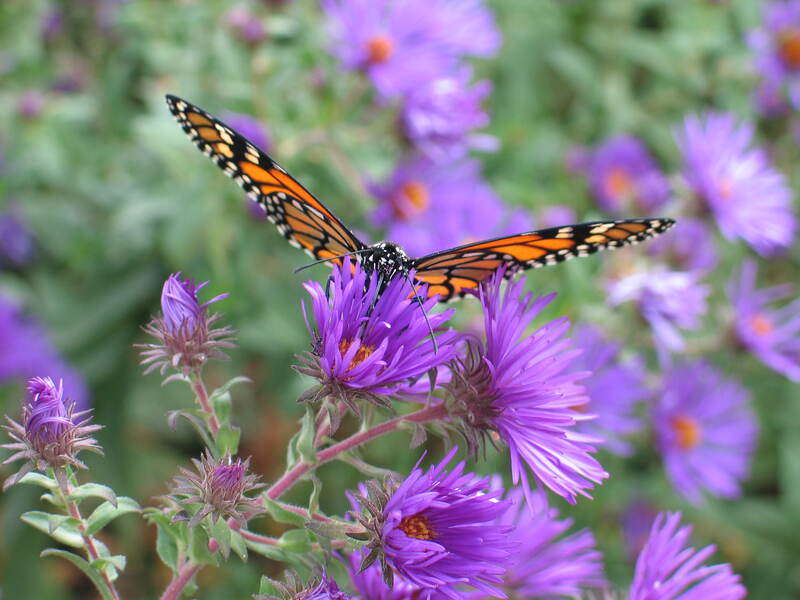 You can be part of the ultimate solution, which is to provide the plants monarchs need for their life cycle. The plight of the honey bee and the loss of entire hives has garnered nationwide attention. However, many of our native bee populations are in danger too. Scientists continue to track dwindling populations of native bees, including the possible extinction of some species. The native pollinators are key components of a healthy ecosystem. The use of pesticides and insecticides, habitat loss, along with the introduced diseases threaten their lives. These bees often lack season-long food sources, which is obviously important to their vitality. Many different pollinators face these realities. Native plants can help us alleviate some of the problems they face. Native plants have the ability to grow in our soils, are adapted to the climate, look attractive, control erosion, create beneficial habitat and are the preferred food source for many of these pollinators. By establishing prairie gardens that use native prairie plants, we can improve their plight in this world. Recognizing that we can make a difference should be motivation to at least begin to help them. Stewardship and conservation can start with our gardens. Despite size limitations, these prairie gardens are an important part of conserving the prairie and the wildlife that depend on them. You might be surprised how much your garden can do to reverse some of these trends. Imagine your garden combined with hundreds of other small prairie landscapes. True, it is not the expansive prairies of the past, but it does make a difference. Your garden can be a piece of the patchwork of prairies. As the weather warms up and perennials begin to sprout I find myself in the gardening mood! Whether filling in gaps in an existing garden bed or planting up a new area, knowing which plants will look best together can be a sort of guessing game. But a fun one! When I start getting too many ideas about what plants to pair up, I put pencil to sketch pad and doodle my ideas into reality. There are countless unique, easy combinations for every situation that can incorporate natives, exotics and even our old garden favorites. Maybe you can use some of my recent sketches, maybe they will inspire you to draw up some of your own! Try partnering bright colored blooms together and using leaf color that adds contrast. For example, using light greens behind darker greens can add depth and interest to an area that is only foliage. You can use striped hostas (Liberty, June Spirit, Brother Stephan) to liven up a dark area and use lowgrowing spreaders as ground cover between them (Ceratostigma plumbagnoides, Gallium odoratum) In my shade garden at home I already have some hostas planted, so I am thinking of filling in around them with some native Silene stellata (Starry Champion) and some non-native Epimedium rubrum (Barrenwort). Waldesteinia fragoides (Barren strawberry) might be the perfect ground cover to suppress weeds around it all. The purplish hue of the epimedium blooms will work well with the yellow of false strawberry since they are complementary colors (situated opposite each other on the color wheel). If you have a shady spot, try planting fillers between hostas to add interest and texture. What plants can partner together to beat the heat? A dry, hot spot is a perfect place for mixing native grasses and wildflowers that have evolved in the prairie sun. For a rock garden or sunny burm, try this combination of Eryngium yuccafolium (Rattlesnake Master) and Eryngium planum (‘Blue Glitter’ Globe Flower) that will complement each other’s whimsical, spherical blooms. Sporobolis heterolepis (Prairie Dropseed) and Delosperma (‘Firespinner’ Creeping Ice Plant) will fill in around the base of the taller plants. 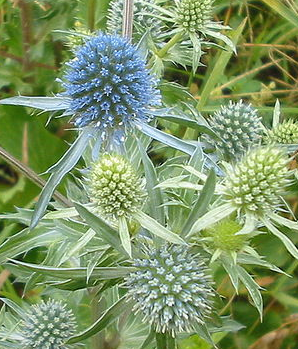 Not only are the Eryngiums major pollinator magnets, they are also long lasting cut flowers! The bright orange-red blooms of the ice plant will warm up the cool hues of the eryngiums. Perhaps growing along a fence or forming a border between yards, tall plants provide structure for the garden. A columnar grass species like Panicum ‘Northwind’ (Switchgrass) or Miscanthus (Silvergrass) can be the eyecatching backdrop for other perennials. They also provide support to tall flowers that might otherwise flop over when they reach their mature heights. Planting Veronicastrum ‘Lavender Towers’ (Culver’s Root) or Eupatorium maculatum (Joe Pye Weed) between tall, strong stemmed grasses can keep them upright in a stiff prairie wind. 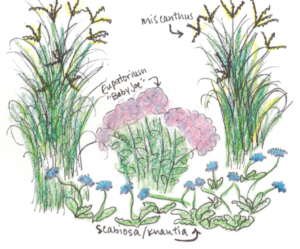 The sketch below shows a shorter variety of Joe Pye called ‘Baby Joe’ situated between some Miscanthus grass with Scabiosa (or, just as well suited, Knautia) growing wispily in front. For an area that can use some height, install some Miscanthus grass for a big effect in fall. 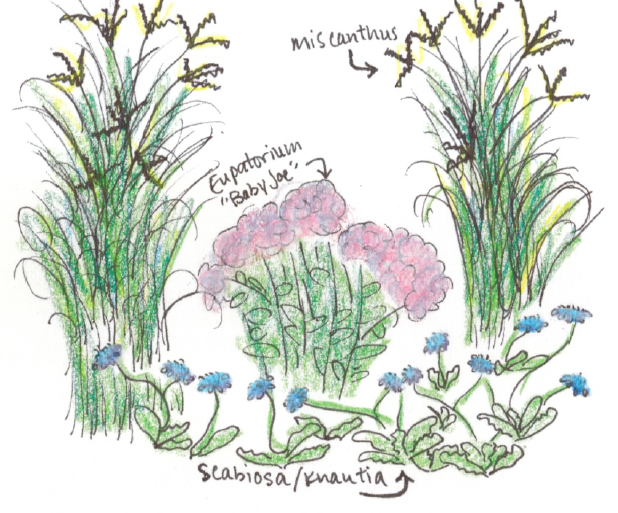 Partnering plants is the fun part of perennial gardening – let your imagination go wild! Use the color wheel to make the most of your pairings and pay close attention to foliage shape and texture to achieve a harmonious look. If you think some of the plants in this post will work well in your yard, come to our FloraKansas Plant Sale April 28th – May 1st! This is our largest fundraiser of the year, and your purchase makes educational programming and the management of Arboretum grounds possible.